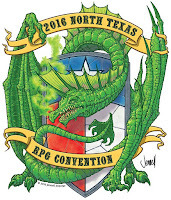 After some brief, but unavoidable, drama and most of a day of travel I was able to get down to Dallas/Ft Worth for North Texas RPG. With an attendance cap of 350, this is probably tied for the smallest "real" con I've gone to*. On the quick walk-through looking for the registration table, which my sleep-deprived brain didn't notice in the obvious location for such a table, I saw a bunch of legends in the RPG world. ....this is a bit bitter-sweet for me because I'm not able to share this con with old friends and my gaming group, and their absence is acutely felt. Thanks to Tenkar's Tavern I have a small dealer table where I'm giving away some "OSR Dice Bags" (Crown Royal bags.....working in a liquor store has its bennies) and offering up prints of my d30 tables, Tweak & Toss adventures seeds, and other writings. The Tavern is in a side room and doesn't get much traffic, which is good & bad. Because I had to use so much space & weight for transporting table-stuff (a couple hundred bags take up a lot of space) I had to skimp out on something, which meant my normal laptop stays at home. I have pics to share, but will save those for when I get back. Inkwell Ideas has all their awesome dungeon morph dice, dungeon morph cards, and creature encounter sets. New Big Dragon Games Unlimited has gobs of cool stuff. I have almost all of it already in PDF, but seeing a nice professional printing.....wow. For the size of this con there is a LOT of art. I try to pick up something on each of my con trips and I already scored two reasonably priced prints. I'm only playing one game a day while here. My 1st game was with Tim Kask. Not only did our group survive, but we all made it. Evidently this isn't normal for Tim's games, but we didn't do some of the dumber things he told us previous groups have done. I played a ranged fighter and stayed in the rear. We were going to be ambushed from behind by the BBG but luckily I made it VERY clear how I performing rear guard duty. Tim had glossed that over (all GMs, including me do this...often) that I was basically facing behind us the whole time. Because of this though, whenever something cool was going on in front of the party...which was most of the time, I was basically out of it. Meh, it was an important job that somebody has to do. I have three more game schedule and I'll give some appropriate non-spoilery details later. I really screwed up my game registration, not getting the games I wanted on paper, but I somehow I got better games than I had planned, so dumb luck was in my favor. *A week or two after Gary's death in 2008 I held a small "GaryCon" in Boise. Attendance was 9 folks from four different states (Idaho, Utah, Oklahoma, & Tennessee). That was a small con.